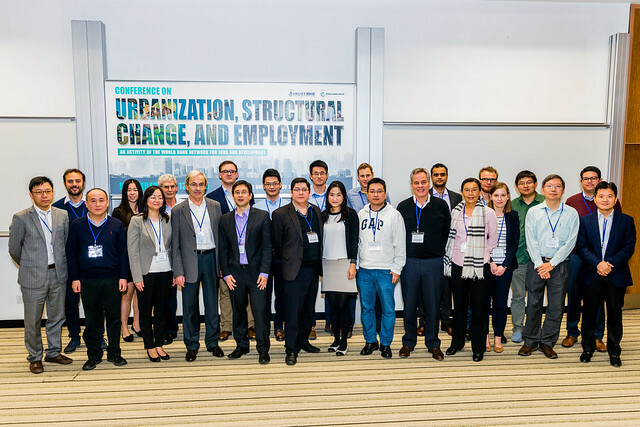 Cosponsored by the World Bank’s Network on Jobs and Development, HKUST IEMS hosted a public three-day conference on December 11-13, 2015 at the HKUST Business School Lecture Theatre. The conference included presentations of original research on a variety of emerging market and developing country-related topics, including urbanization, determinants of structural change and consequences for labor demand, technological change and effects on labor demand, globalization and effects on employment, and economic growth. Sir Prof Christopher Pissarides, Nobel Laureate, Professor of Economics at the London School of Economics, HKUST IAS Professor-at-Large, and HKUST IEMS Faculty Associate, began the conference by discussing China’s labor transition from agricultural to non-agricultural sectors with overall employment declining as a result of China’s urban-rural household registration system acting as a migration barrier. Drawing from his analysis of a 2-sector model using the migration barriers imposed by China’s urban-rural household registration system, Prof Pissarides suggests that the removal of this registration system should increase the flow of workers to urban jobs, reduce the prices of urban goods, and increase welfare in general. Joseph Kaboski, Professor of Economics at the University of Notre Dame, detailed his study into agglomeration and competition—or the lack thereof—using China’s Special Economic Zones (SEZs) as an illustrative example. Prof Kaboski’s analysis centered on data from the annual survey of Chinese Industrial Enterprises comprising all state-owned enterprises (SOEs) and large non-SOEs from the period of 1999 to 2009, and comparing them to data on firms located within China’s SEZs. His results suggest that 10.6% of Chinese firms located outside of SEZs engage in collusion, whereas 45.3% of firms located within SEZs engage in collusion. Prof. Kaboski also cited the synthetic crude oil , bamboo furniture, vinylon fiber, lighting apparatus equipment, and silver smelting industries as the top 5 most agglomerated industries in China, as well as the ones most likely to be engaged in some form of industry collusion. Xin Meng, Professor of Economics at the Australian National University, described her research on China’s current labor market tensions, and challenges to its future urbanization plans. Between 2012 and 2013 the real wages of migrant workers in China increased by 12.3%, even though real GDP per capita only increased by 7.7%, and increased a further 7% between 2013 and 2014. While many have regarded this trend as a sign of unskilled labor shortages due to reduced labor supplies from rural areas, Prof Meng insisted that the urban labor shortage was due to restrictions on rural-urban migration. Using a variety of maco-data from the Chinese Bureau of Statistics comparing ague distributions of migrant workers in various Chinese cities from 2008 to 2014, the changes of urban minimum wages from 1995 to 2013, industrial upgrading data from 2007 and 2012, and other data, Prof Meng concludes that China’s urban labor shortage is not primarily caused by industrial upgrading—an idea that is promulgated at many levels in China’s policymaking cadres—but rather is caused by restrictions emanating from China’s rural-urban household registration policies restricting rural labor supply to urban areas. On the topic of how to avoid the problems of pollution, congestion, slums, and other negative conditions associated with megacities in the developing world, Professor of Agricultural Economics at National Taiwan University Chu-Ping Lo outlined the impact of foreign direct investment (FDI) on the phenomenon of rapid urban concentration. To test his theory that urban concentration is reduced with greater trade liberalization, Prof Lo created a two-country model with a developed and developing country, labor as the single factor of production, an inelastic labor supply in the developing country, a freely mobile workforce, and imported-good tariffs present for the developing country but absent in the developed country. His main conclusions were that, in order to avoid the formation of megacities, developing countries should not only open their doors to traditional trade, but increase their acceptance of FDI. However, before carrying out such liberalization policies, it’s imperative that governments in these developing countries first improve their infrastructure in order to reduce local transportation costs, as sufficiently low transportation costs will help discourage workers from migrating from rural areas to bourgeoning megacities. Other presenters at the conference included Xiaodong Zhu (University of Toronto), Feicheng Wang (University of Nottingham Ningbo), Rachel Ngai (London School of Economics), Ping Wang (Washington University at St. Louis), Ming Lu (Shanghai Jiaotong University), Loren Brandt (University of Toronto), Gary Fields (Cornell University), Todd Schoellman (Arizona State University), Alessio Moro (University of Cagliari), Yong Wang (HKUST), Yang Du (Chinese Academy of Social Science), Piotr Lewandowski (Institute for Structural Research Warsaw), Timo Boppart (Stockholm University), Roberto Samaniego (George Washington University), Sebastian Monroy (World Bank), Pankaj Vashisht (ICRIER), and Albert Park (HKUST). The program can be found here (PDF). All publicly available presentation slides and papers can be downloaded here.